At the Google Global Partners’ Summit this year, the search-engine giant shared data about what online audiences are really looking for as we move into 2018, and their answers were clear. Your potential clients are continually looking for more from the online experience, and they still want their needs to be the center of your website and digital marketing attention. If you want to stand out from the competition, Google suggests that you pay close attention to their three biggest demands. Overall, people are less patient than they used to be online. When they turn to their computer or phone for answers, they are looking for someone who can help right now. Google data shows that 53 percent of mobile users will give up on a site that takes more than three seconds to load, and the number of users that “bounce” increases dramatically as the seconds tick by. Desktop users aren’t all that different. Users will also move on if it takes too long to find what they need, even if site loads quickly. Confusing navigation, broken links, bizarre architecture, and other immersion-breaking obstacles make a bad impression that will linger. Don’t make your potential clients hunt around for answers. If you can’t provide fast, relevant help when your potential clients need it, then they won’t stick around or wait in line. They’ll move on to someone who can immediately give them what they need, on whatever device they choose to use. Find out how to provide a better user experience online. People now expect a more personalized experience when they visit businesses online. They don’t want to receive generic spam or read content that has nothing valuable to offer. Instead, they want to work with businesses that understand them and speak directly to their needs. That means that everything you do to market your business to a target audience—from paid ads to blog posts—needs to be tailored to the data you have about them. This is an especially important consideration for lawyers and doctors because they rely on building trust with potential clients. Modern digital marketing gives businesses enormous opportunities to target specific audiences and gather data about their behaviors. If you aren’t gathering the data and putting it to use, then you aren’t providing the best experience you can for your audience. Because our websites are powered by DSS, our clients gain a huge advantage: content is dynamically displayed, based on what part of the site a reader is visiting. If someone is reading a blog post about car accident laws, he is going to see other content about car accidents in the sidebar modules. 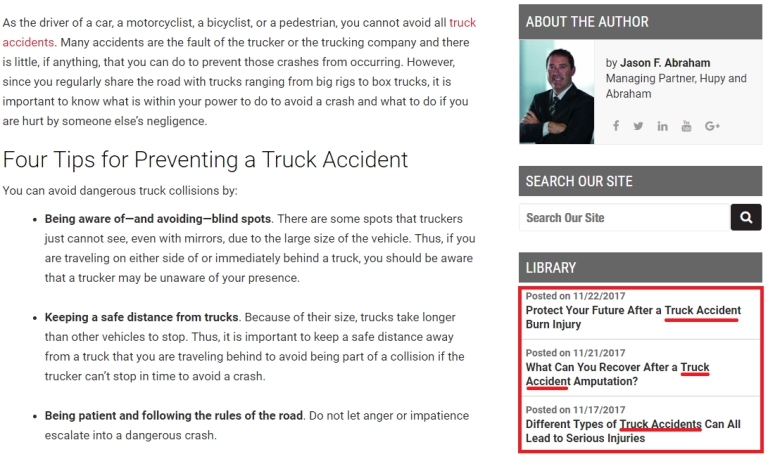 Here’s a great example: this truck accident FAQ with related articles about truck accidents. As long as you're adding content to the most relevant practice area category on your site, you’re improving the overall user experience and showing your users you know them better than your competition. Ask yourself what your perfect clients are looking for when they see you online and how you can deliver it more clearly and conveniently. If you need help setting up target audiences or making sense of analytics data, give our expert marketing coaches a call. Getting a grip on your perfect target audiences can take some work, but Google reports that 90 percent of organizations that put the investment in more personalized consumer experiences believe it has contributed significantly to their profitability. Maybe your website already provides a fast, convenient user experience that is tailored to your perfect clients. Google tells us that, in 2018, it can’t stop there. Increasingly, users are looking for businesses that can offer a consistent, branded experience everywhere they go, online and off. There should be harmony between the online image you’ve created and the experience clients have in your brick-and-mortar office. You should be available when and where your potential clients need you, and you should strive to meet them in customized “micro-moments” when they need your help online. Although the data from Google is new, the trend toward more customized and convenient online experiences has been developing for years. Do you need help reaching your perfect clients or adjusting for a modern online audience? Are you getting lackluster results from your current digital strategy? Start the new year with a fresh perspective by reaching out to our marketing experts for a free website analysis.